bpm’online is enterprise CRM and business process management software. Ideal for: Larger real estate teams and offices, but scalable. While bpm’online is quite scalable and priced for all size of brokerage, it’s going to benefit firms that can leverage its rich marketing and prospect funneling features to their fullest extent. 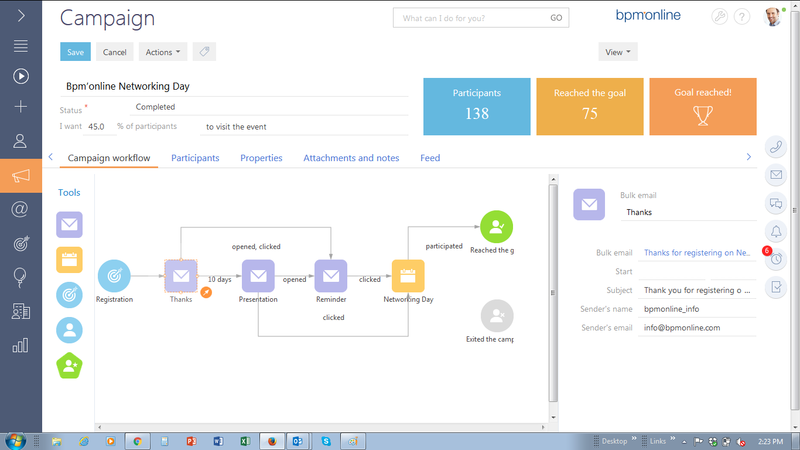 bpm’online integrates business process management with marketing and contact management to offer a uniquely powerful CRM. It’s a sophisticated software designed to help run a smarter sales environment. bpm’online is sophisticated software designed to help run a smarter sales environment. Its icon-heavy navigation, strong visuals and nimble UX succeed in making this business tool the exact opposite of hard. It will take training, but I can’t picture it being a challenging onboard. The sophistication lies in its focus on the strategic. Its programmatically flexible and visually ergonomic interface allows users to design workflows for specific aspects of a real estate business. Basically, brokers and office managers can use a visual “map” to create rules around creating marketing campaigns or which leads require follow-up and when, or which tasks have to be completed before an offer is sent. As processes are created, so are office-wide efficiencies, allowing brokers and office admins to create operational structure without hampering sales efforts. In most cases, better processes strengthen a sales environment. Within all this big-picture stuff lies a toolbox of features common to CRMs. There’s an email marketing suite with templates and metrics on par with most stand-alone email marketing products; landing pages that can filter leads to specific property folders within the system; an intricate contact management database, and an IDX connection to bind an entire MLS worth of listings to buyer and seller information. bpm’online can match leads to listings and follow up automatically with a brochure that details them for the client. However, that functionality depends on your office’s designed workflow. Maybe you only want it to send when five or more listing matches appear. Or only once each week. On Thursdays. This software is designed to help real estate offices be more proactive when serving the 10 percent of their database that is actually ready to buy. The other 90 percent is served through email campaigns, general marketing and ongoing lead monitoring. Communication history is recorded for each contact, as are social network connections, general information requests and any other point of interaction within the system. 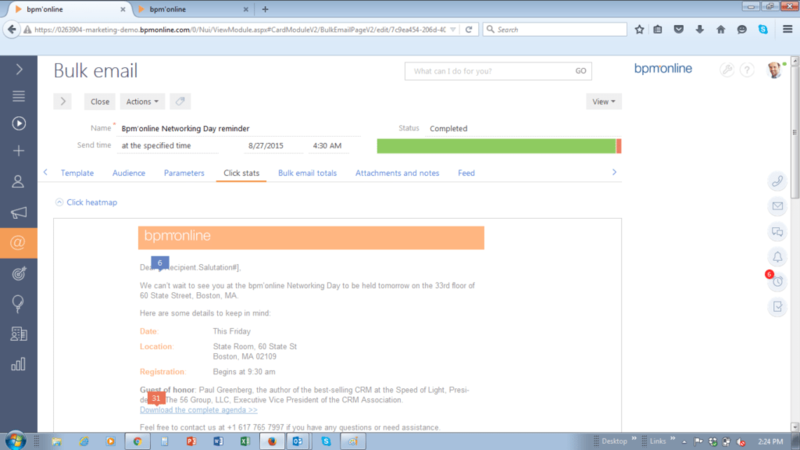 bpm’online also manages an office’s listings apart from the greater MLS feed. This includes any interested buyers, connected documents, notes and internal communications. 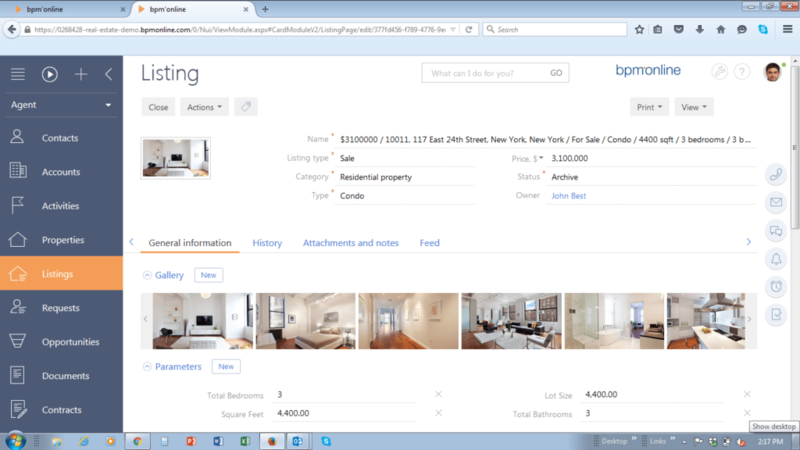 As new listings come in, bpm’online will run a matching profile against recent requests and existing contacts. Another useful component is the Feed, an ongoing list of internal discussions, resources and news. Items can be liked and commented upon, too. bpm’online is well beyond a CRM. bpm’online is well beyond a CRM. However, there isn’t really a more apt category in which to place it. It’s also one of those tools that I don’t fear is trying to take on too much. That concern is alleviated by its scalability and configuration opportunities. Because of its intrinsic malleability, it’s more of a CRM platform than a single-purpose real estate software product. Strongly consider short-listing bpm’online if you’re in the market for a better-run real estate business.